Judges evaluate the 4-H member’s skills, neatness, organization, taste, appearance and nutritional value. 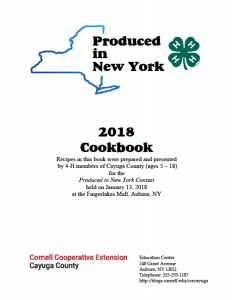 The members will fill out a Menu Planning Sheet which describes a complete menu for one meal which includes: the featured recipe, a statement of where the recipe came from, lists major nutrients found in the recipe and their function, and information about the featured New York State product. The top 6 participants are specially recognized, and receive first chance at representing Cayuga County at the New York State Fair contest. Register online or contact the office to participate!